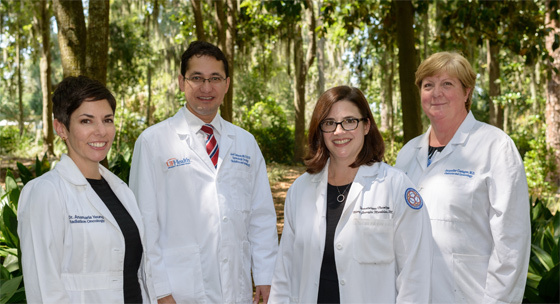 As experts in gynecologic cancers, the board-certified University of Florida physicians at the gynecologic cancer program have a long history of treating the most challenging patients. They provide specialized treatment, delivered in one of the most advanced cancer facilities in the nation: University of Florida Health, rated as one of the “Best Hospitals in America” for cancer care by U.S. News & World Report. The gynecologic cancer program provides a truly multidisciplinary approach to cancer care, the kind of approach available only at an academic medical center. The team below meets weekly to discuss cases and develop the most comprehensive, multidisciplinary plan uniquely tailored to each patient. The exchange of knowledge and opinions among team members means that patients benefit from the combined expertise of multiple cancer specialists from many disciplines who carefully review patient information and develop the best possible treatment plan for each individual.